Freeport, Grand Bahama Island - The ultimate Dinner Concert party 2019 is On! 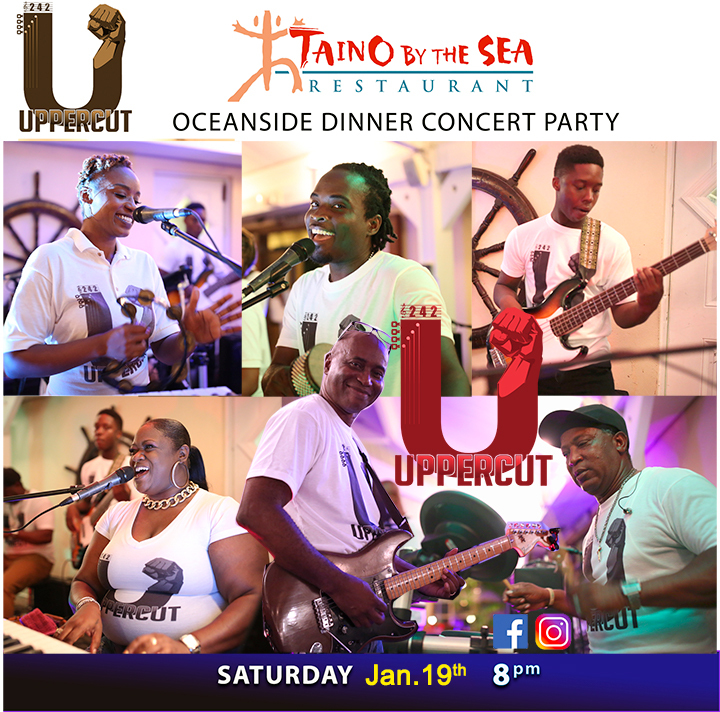 It's happening oceanside at Taino by the Sea, Saturday January 19th, 2018 as the Uppercut 242 Dinner & Free Concerts series recharges and resumes at the ultimate Oceanfront party spot, Taino by the Sea. There'll be a super special Dinner Menu, cool refreshing drink specials and loads of waterside fun. Grand Bahama’s ultimate high-energy band, UPPERCUT invites you to party with us! Featuring the dynamic Javan Hunt (lead vocals), bandleader David Mackey on wailing Guitars from the Grammy Nominated T-Connection band, David ‘Shakey’ Williams (Drums, raps and vocals), Shaquita Stubbs (keyboards and vocals), Bonzi Ferguson (Bass), Guest artist Niki Hunt (vocals).